Microsoft uses Cirque Du Soleil to show off its latest motion control technology at E3. I wasn't sure what to expect. After an interminably long line outside USC's Galen Center in downtown Los Angeles, members of the videogame press and other notaries were ushered inside and asked to don white faux-silk smocks. I thought that these over shoulder-padded "ponchos" were to protect our clothes from water or mess a la Gallagher or New York's De La Guarda. We felt somewhat ridiculous, garbed as we were in white material, but we allowed ourselves to be brought into their world. Inside, the Galen Center was transformed from a basketball arena into a jungle showcase. On the floor, Cirque Du Soleil performers strutted their stuff, clowning with ingenious props (such as a plush "telescope" the lens of which lit up like a spotlight) and drew people out of the crowd into their mischievous, elfin world. The motif of leaves and branches was everywhere, and the performers reminded me of nothing more than the Brownies in Willow. What all this had to do with Project Natal, I don't know, but it was entertaining to watch a man in a gorilla suit prance around a bunch of stuck-up videogame journalists. After a terribly long time, the "show" began. A very loud voice told us that a long series of mechanical computer inputs had alienated most of mankind and that it was now time for the human input to reign supreme. With true Cirque pomp and circumstance, a boy rode in on a fake elephant and ascended a series of rocks, playing games using an Xbox controller. The last rock was revealed to be a sphere made to look exactly like the Xbox logo. A manifestation of the boy was projected on a white screen, jumping and moving his hands in time with actual movements. The boy asked, "What is your name?" The screen showed a jumble of letters which were finally revealed to read "Kinect." The boy was then beckoned to join a family at play and the real demonstration began. With no introduction, a series of games were shown in succession, controlled by the family in a white room. First was a rafting game, where the kids could lean and jump to score points as the raft went over ramps and fell down waterfalls. Next was an obstacle game that had the family dodging bumpers and reaching to grab balloons to score points. Track and field events had them running and jumping hurdles while a racing game used two hands extended to steer and leans to perform jumps and tricks. The most exciting game shown, at least for me, was Star Wars. The "father" of the family, Mark, swung his arms as if he was wielding a lightsaber and cut through storm troopers on the planet of Daboo. Reaching out his hand performed force powers that knocked down troopers and even ships until he was met with a terrifying foe: Darth Vader. Mark and Vader faced off, clashing lightsabers and that segment of the demonstration ended to the only genuine enthusiasm I heard in the crowd all night. There were a few more impressions of games shown, including a yoga instruction and a dance game, but they were only impressions. I left the performance feeling that it wasn't quite a dance show and it wasn't quite a press conference, but some weird mash-up. Microsoft certainly displayed its monetary resources by making such a show happen for just one performance, although, with the heavy amount of cameras and a generous TV schedule (check your local listings! ), it's likely it will try to get as much mileage out of the show as it can. Oh and those ridiculous smocks? The shoulder pads all lit up for the finale in different color patterns, based purely on where we were standing or sitting. The catch was that there was no assigned seating; the placement of the audience was purely random, yet the patterns shown were not. 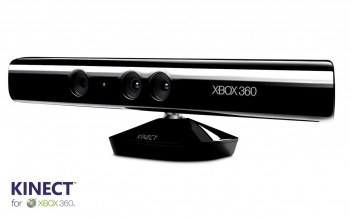 It was a simple, yet amazing display of the technology behind Natal, er, Kinect. And if Microsoft could do it to impress a bunch of videogame journalists on a Sunday night, then it might just have the moxie to make it happen for the rest of the world.